Do you remember that vintage cupboard that I found last year? with not one single thing on the shelves. But add a few pieces and it takes on a whole new personality. and a few little baby pumpkins. You might remember me sharing a few photos of this cupboard in my early Autumn Home tour . 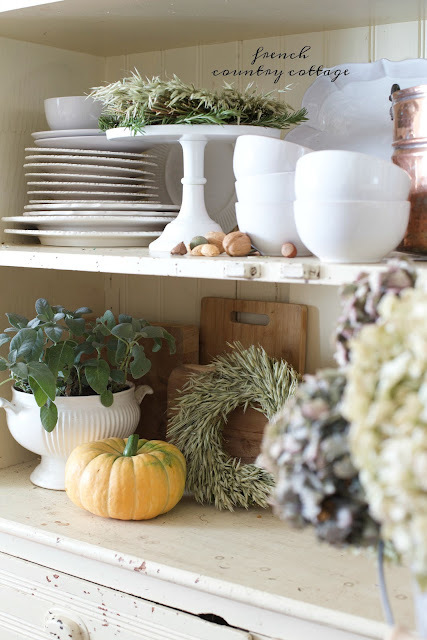 And today, I am sharing a closer look and a few tips on how to style a cupboard for autumn. And this is the first of several posts on this same topic. This cupboard is creamy white and vintage- and I also have that tall dark and handsome buffet deux corps in the living room to share- and they both have different ways to going about styling them since they are so different. Simple whites and bread boards and that was about it. But that was exactly perfect. lean platters and large plates and cutting boards against it. they add height and bring the background 'closer in' to fill in some of that space and warm it up. 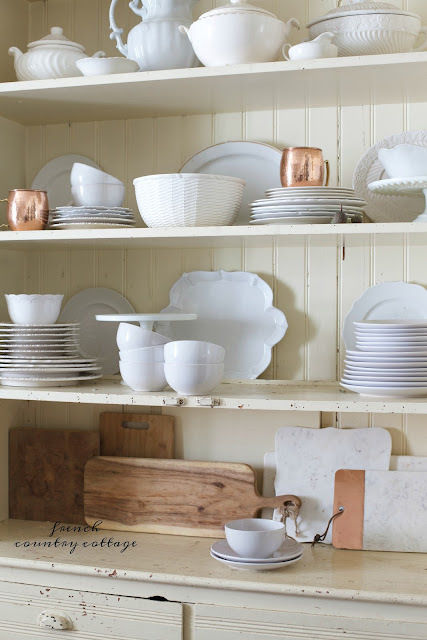 Plates, bowls, plates and bowls, cutting boards, you name it. way to create a charming display. started stacking and now it is time to fill in those shelf areas with large and small pieces. 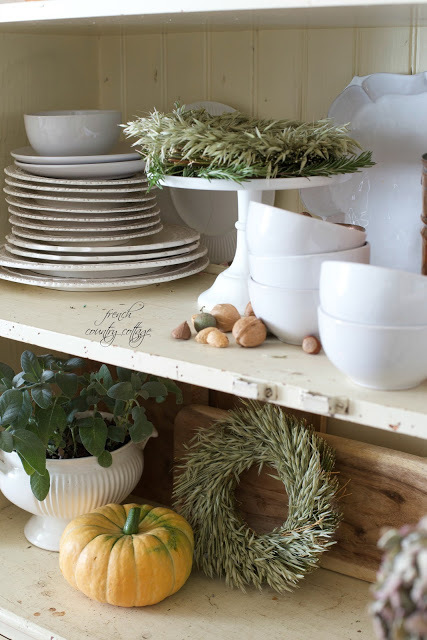 chunky serving bowls and pitchers are all perfect for filling in those shelf areas. Or in this case, something copper. 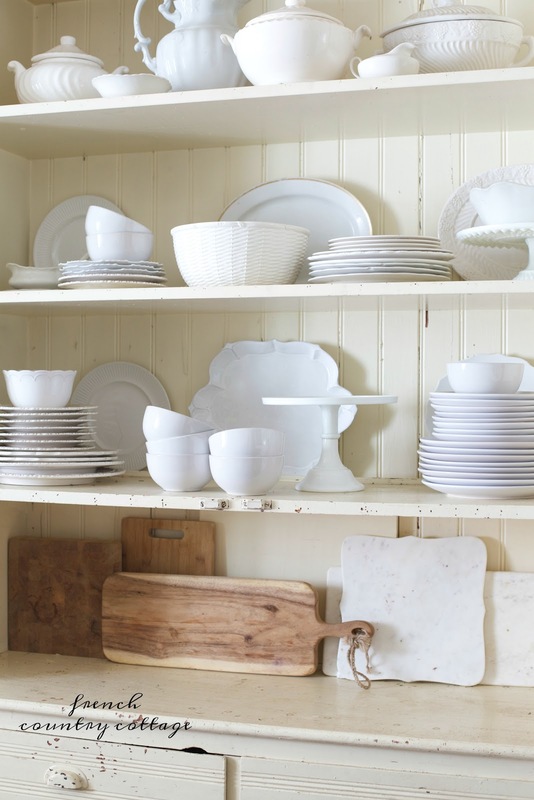 or simple and soft like sage is a great way to make the cupboard feel more 'homey' if you will. 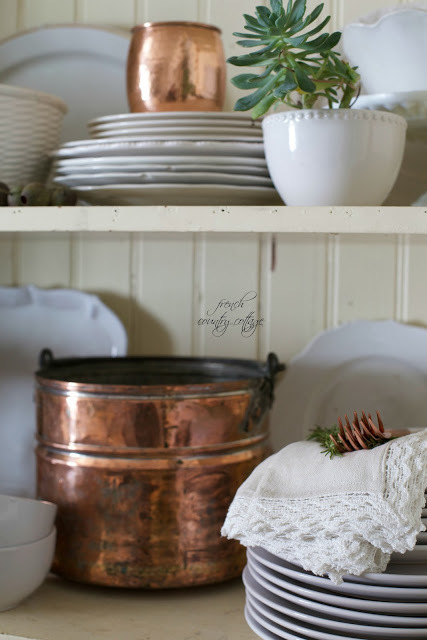 Copper is of course, always a huge fan of mine for autumn- and I have several pieces that I love to play with and use. Bringing more than just one or two pieces of your 'pop' choice is key. to keep your eye moving. until it was pleasing to my eye. 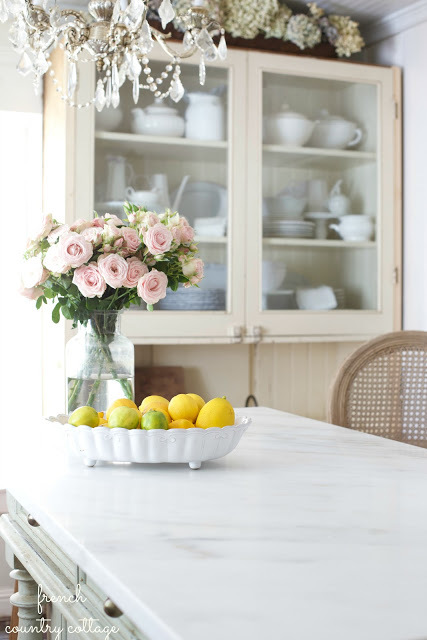 I am a huge fan of fresh flowers, fruits and veggies and fresh herbs. you can also tuck those herbs into your display and have them do double duty. 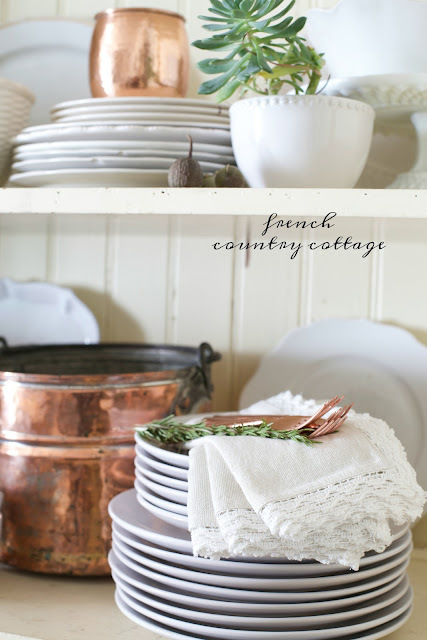 Another favorite for cupboards? Something like a simple succulent. they will love you even so. 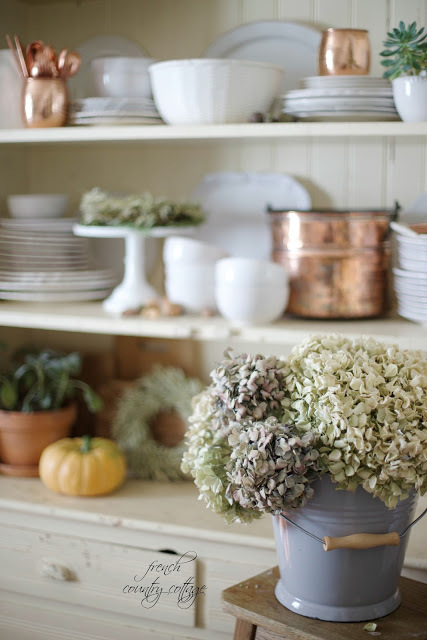 small dried herb wreaths and an enameled bucket full of dried hydrangeas. and how things move and you play with them. and something exciting to share. and say hello. It is so much appreciated and I am so grateful to be on your reading list. Hope your Wednesday is off to a great start everyone. That wreath makes me think of rosemary, of which I have plenty. In fact, it is threatening to take over the yard. I really ought to cut it back and make a wreath, which would (1) halt the Invasion of the Rosemary, (2) be pretty and (3) smell great. Inspiration is why I come here. Thanks! I remembered the post when you bought the hutch, I love it, full of patina and what stories it can tell. 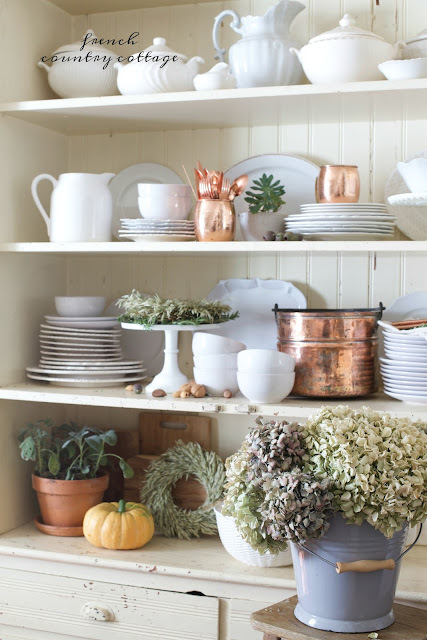 The way you mix the dishes with seasonal decor is perfect, just beautiful! 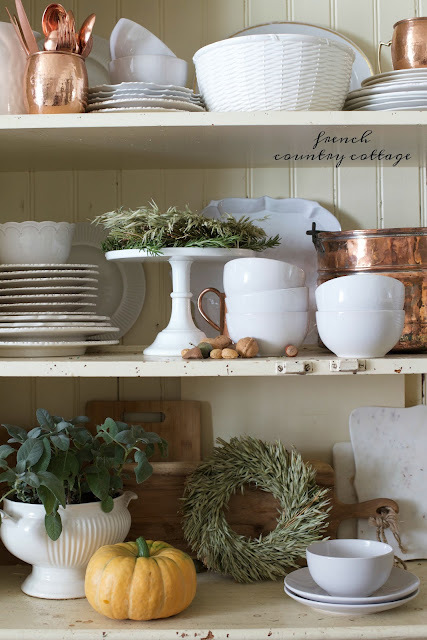 I have an open dark green hutch and thank you for more ideas for it:). Really enjoy reading your blog and admire your ability to post interesting topics so frequently. Thank you!! I love the cupboard. It is just darling. I love copper in autumn too. It is styled perfectly as usual. The cupboard is very cute and I like the video that is shows what you started with and the finished view. The cupboard is beautiful on its and a d all your beautiful accessories just brings it to life! Thanks for the inspiration- I’m thinking of ways to chane around my cupboard now. I’m especially loving the enameled bucket. Have a wonderful day!